Apple continues to completely dominate the tablet market, but with new competition directly from Google, Amazon and Microsoft, can they keep it up? While people were mulling over Apple’s earnings numbers on Tuesday, one number in particular stuck out for me. Apple sold 17 million iPads in the quarter, an 84 percent increase over last year, but what’s more, they actually increased their already impressive worldwide market share. According to numbers released by Strategy Analytics, last year in the second quarter, there were 14.2 million tablets sold worldwide. This year it was up to 25 million, an increase of 67 percent (a number that’s bound to increase as Google and Microsoft both join the tablet game this year). Last year, Apple owned 62 percent of the overall market. This year, that number increased 6 points to 68 percent. Apple’s overall numbers almost doubled from last year from 9.3 million to 17 million units. It’s worth noting that Strategy Analytics measures what they call “units shipped,” rather than units sold, but the 17 million number they cite matches the number Apple reported selling in its earnings call. As a means of comparison, Android tablet shipments (across all manufacturers) remained static at 29 percent. Microsoft captured just 1 percent of the total market, down 3.5 percent over last year, but with Windows 8 coming later this year, that should move the needle at least a bit for them, at least it better. Yet in spite of these numbers, the market appears to be very much wide open. Google reportedly sold out very quickly of the 16 GB Nexus 7 tablet. When I checked the web site this morning, there were still 8 GB units available. Of course, it could be that Google only shipped a small number so it wouldn’t face the same overproduction that crippled RIM and HP last year when they released their ill-fated tablets — and quickly forced HP into a fire sale, selling them off at a steep loss for $99. While the Nexus 7 appears to compete more with the Kindle Fire than the iPad, the market share numbers will probably never make that distinction. I doubt very much people will use the Fire or the Nexus 7 for work machines, whereas iPad has made good headway in the enterprise. It’s also worth noting that when the Kindle Fire first appeared on the market, it too benefited from an initial boost before sales fell quickly back to earth. But Amazon isn’t giving up yet. There are reportedly new Kindles on the way including a 10 inch one, which could compete more directly with iPad (at least in theory). In fact, The Wall Street Journal has an article this morning about the growing Amazon-Apple “war” as they call it, as the two companies increasingly compete on common territory. So far at least, except for eBooks, which is of course Amazon’s sweet spot, it appears that Apple is winning most of the battles easily. Which brings us to Windows 8, the great enterprise hope. Microsoft is banking on an enterprise hungry for a business-oriented device, but is there a waiting market? Some believe there is. Appcelerator, in conjunction with IDC, recently released a report on the state of the tablet market. According to the report, “Android’s inability to fully develop its enormous enterprise potential as late as mid-year 2012 underscores its potential vulnerabilities in the enterprise.” Appcelerator believes this could leave an opening for Microsoft, but it’s still unclear if Microsoft can take full advantage of this opportunity. 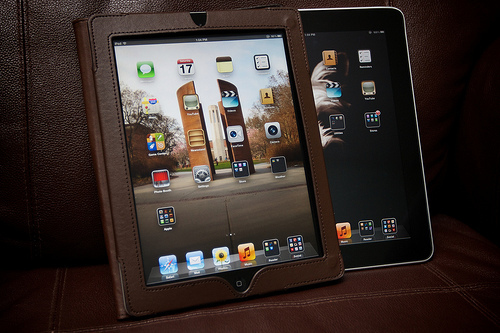 For now, in the tablet market, it’s all Apple, all the time. Up to this point, Apple has been able to maintain its market share each time the competition seems to heat up. This year will be even more challenging than ever as the opposition continues to push for its share of this growing and lucrative market. Should be interesting to check the numbers a year from now and see if Microsoft, Amazon and Google made any headway. Photo by Yutaka Tsutano on Flickr. Used under Creative Commons License.